Tonight on ABC is an all new episode of GREY’S ANATOMY. Tonight’s show is called “Transplant Wasteland and on tonight’s show tensions rise as new management takes over Seattle Grace. If you missed last week’s episode we have a full and detailed recap here for you. On last week’s show as word of Seattle Grace’s financial trouble spread, Catherine encouragesd Jackson to move to Boston, and the interns feared they might lose their jobs. Meanwhile, the doctors met with a potential investor in a last-ditch effort to save the hospital, and Alex impressed Jo while caring for a patient. On tonight’s show he discord and chaos created by the hospital’s new management team causes one physician to question his future at Seattle Grace. Meanwhile, the doctors and the interns must juggle several transplant surgeries at once, each coming with its own set of obstacles. On tonight’s show Debbie Allen (“Fame”) guest stars as Catherine Avery. Tonight’s episode looks like it is going to be a great episode and you won’t want to miss it, so be sure to tune in for our live coverage of ABC’s “Grey’s Anatomy” Season 9 episode 15 at 9 PM EST! While you wait for our recap hit the comments and let us know what you think of Grey’s Anatomy season 9, so far? Check out the sneak peek of tonight’s episode below! The doctors are discussing whether to let someone have a heart based on his past as a felon, as well as reopening the E.R. and trauma center. Avery says the E.R. is not a forgone conclusion. He also says that since they are starting fresh, new leadership will be necessary. Christina says she doesn’t care who is giving marching orders, but Owen isn’t going anywhere which leads to a standoff. Christina tells Owen that they are talking about replacing him. A patient named Brad says he is donating his organs. He says he’s only being kept alive by a machine and the chief signed off and they walked in on his funeral. Owen asks Avery if he’s in or out. Owen is tired of being shut out of every decision after working tirelessly for the past few weeks. Derek tells Owen that there are politics involved. Owen says that Derek and co made the mess that they’re in. Derek says that he doesn’t want to get into who’s responsible for all of this. Owen makes the decision easy for everyone and quits. Owen tells Christina that he should’ve been done a long time ago. He offers her advice on the organs before driving off. Catherine tells Avery to put on his game face and listen to the suits while they explain paperwork. Jayla is told that a kidney has been found her by Alex. Bailey wants to know when are all these protocols came into place and wants Avery, the de facto boss, to fix it. In addition, all the surgeries are being pushed up but they are running out of emergency rooms. Brad fires April as she tries to encourage him to keep on fighting for his life and not prematurely donate his organs. Alex tells Jayla the medication she has to take or else she will lose the kidney. However, Jayla decides to lock herself in the bathroom. Alex gets a hold of her boyfriend’s cell phone and texts her. Jayla is not ready for the surgery and wants to know if she can take the next one. Alex tells her that she needs to take good things while they’re in front of her and relates to how he lost April to another guy. Christina is talking to April about Brad and she comments that he has good organs. She seemingly gets an idea and leaves the room. The new rules lead to kidneys’ being flown over the country despite being needed for surgery. Avery is overwhelmed. Richard thinks Avery is overwhelmed but Catherine is defiant that he stay on as acting chief. Avery overhears their conversation. Brad explains to his parents what will happen when he flat lines. His mother says that she will support him and if he has any doubts, he can stop it. April says that Brad is still a doctor and that his organs will save lives. April says that she gets it. His mother asks April to keep going as to how he will be able to save lives in death. 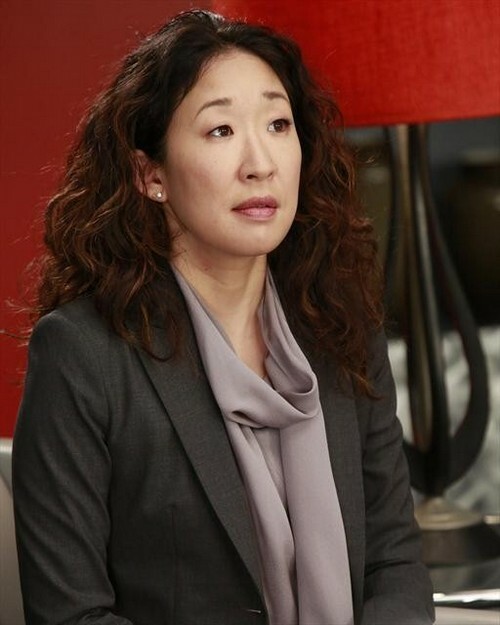 Christina says that Derek reminds Owen over and over about the plane crash. She wants to know what it’s really about because it’s not about Owen. Christina and Alex get into an argument over the last O.R. Avery takes charge and instructs for Yang to get the OR and for Alex to wait. Bailey backs him up. Meredith returns with the kidney for Jayla. Meredith tells Alex to drop the attitude before no one wants to work with him anymore. Derek goes to visit Owen. Derek says that no one blames Owen for the crash. Derek says he has been mad at the world and pissed at Mark. Brad’s loved ones pay their respects to him as he dies. His mother collapses onto his body as time is running in order to harvest his heart. April pulls her off. Catherine brags that Avery stepped up. Richard says that he got through the day; she wants him to step up but the steps are too high. Catherine says that he is crossing into giving parenting advice. She says she has been a single parent for over 28 years and it’s hard not to chase off a guy that cares. The gang is the officially the new board of directors after signing. Avery says he wants to reinstate Owen as C.O.S and will reopen the E.R. ; that the foundation will be following their lead. Avery says they should rename the hospital to honor its spirit and why they’ve come together. He suggests Grey Sloan Memorial Hospital. All are in favor.